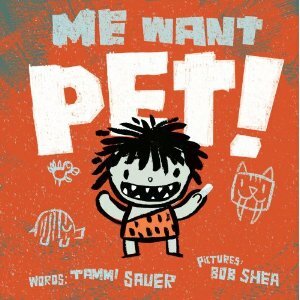 I just received my copy of Me Want Pet! by Tammi Sauer. I won it in give-away on Elizabeth Stevens Omlor’s Banana Peelin’ Blog. Synopsis: (from Barnes and Noble) Cave Boy wants a pet more than anything. Can he find one that the whole family will agree on? Cave Boy has lots of things. Rocks. Sticks. A club. But no pet! Cave Boy decides he must have a pet, but his parents object. He brings home animal after animal in hopes of overcoming his parents’ steadfast resistance, but his attempts are unsuccessful—until he finds a Dodo bird that is literally on the verge of extinction. And in a twist ending on a classic concept, Cave Boy and his family discover it’s worthwhile to have animal friends around. With snappy text that is short, fun, and young, Me Want Pet! makes for an ideal read-aloud for the milk-and-cookies set. Resources: Since this book is just out, I didn’t find resources. But I have ideas. Use brown lunch sacks and have students draw their cave-person self on the outside. Then do one of the activities below. Have them draw 3 cave pets they would like to have and put them inside the bag. As they pull them out they can share about the pets they drew with parents, siblings, group, or classmates. If you do this with a group of children, have them draw Woolly, Toothy, or Dodo and put it in their bag. As they reveal which pet they chose to draw, use tally marks to count how many children drew each of the pets. Then make up some word problems with the results. For example: If Cave Boy had 7 Woollies, 4 Toothies, and 9 Dodos, how many pets would that be? If they only allowed 5 pets per cave, how many caves would they need for all of the pets to have a home? Alas, I have no lunch sacks to try this…but I found this activity HERE for a hibernating bear which could easily be used for a Me Want Pet! activity. It would be extra cute to glue Cave Boy and a pet or two on the cave and lay sticks and rocks inside and around the cave. Have children do their own cave drawings on a piece of brown paper. If it is for a classroom of students, it would be cute to have them draw on a large piece of butcher paper with black crayon and create a host of pets they would like to have if they lived in a cave. This would be a fun activity, also. Tara Lazar had a contest on her blog a while back. She asked that kids draw Cave Boy and a new pet. The contest is over, but HERE is a link to her original post with a couple of drawings on it…and then HERE is a link to the winning drawing and a few more. Synopsis: (from Amazon) Bobby Bramble has a thirst for adventure, a taste for danger, and energy to spare. But no one in his family seems to appreciate these traits. Instead, they worry that he’ll fall and crack his skull open—and one day that’s exactly what happens. 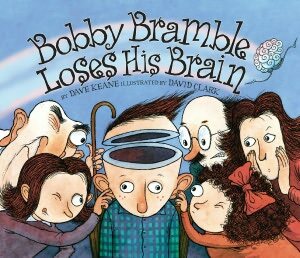 To make matters worse, Bobby’s brain decides to take off, as if it had a mind of its own. What follows is the madcap pursuit—and recapture—of the elusive gray matter and the successful reunion of brain and brawn. A hilarious cautionary tale full of mayhem—and wordplay. “He’s as dumb as an onion, Dad, ” said Bonnie. Resources: I did not find any resources for this book. Here is a great activity that Beth Stillborn suggested: One potential activity, based on the snippets of text you’ve given, might be to talk about figures of speech, and how they can mean something very different to their literal meaning. Lost his mind? A very quick mind? What others could kids come up with (not just about brains). I have an idea, too. While studying the organs of the body, this could go along with facts about the brain. In the book, there is a line that says, “Oh, I imagine it’s gray and about seven inches tall.” The class could talk about actual size and color, and depending on the age level, they could go into more detail. Oh! Just thought of a couple for writing activities.Where are three places your brain would go if it ran away? If your brain ran away, what would tempt it to come back home? Why I Like This Book: It’s funny from beginning to end. It is the sort of story that will entertain adult and child readers, alike. David Clark’s cartoon-like illustrations add a hilarious, comical element. He nails the expressions of the characters throughout the book. 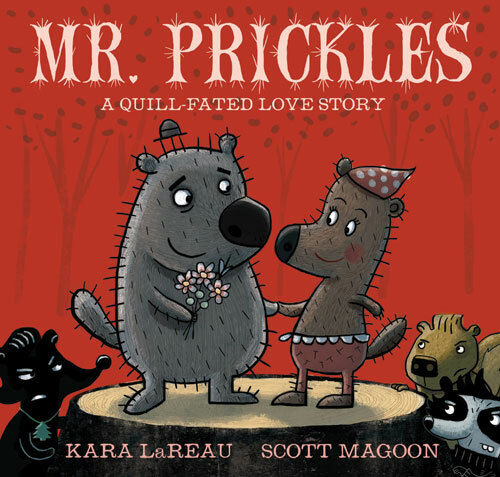 The silliness in this story is contagious, which will make it a repeat read-aloud for the family or for a classroom. It’s hard to pick a favorite part from a book this entertaining, but if I had to, it would be Grandpa setting brain traps by using flash cards as bait! Totally cracked me up! Hello from West Texas. I’m excited to be here in Abilene! The skies are filled with puffy clouds and the temperature is 60°. 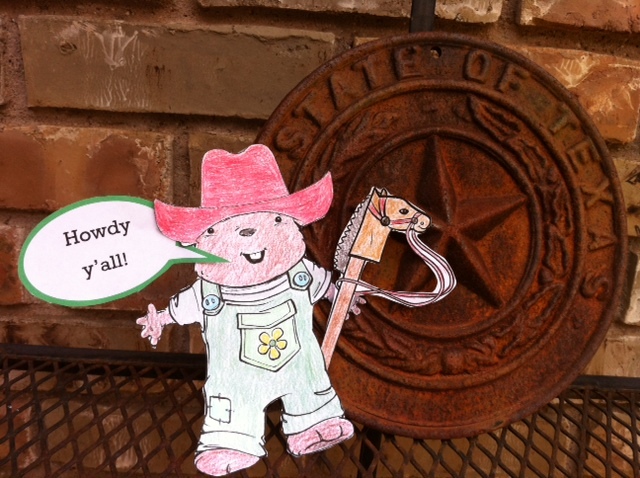 I have to say these are “wide open spaces” out here…but my hostess says there is plenty to see. I’m skipping up the sidewalk to check out my digs. My host, Penny, was very excited to see me. She said she is a Phyllis World Tour groupie. 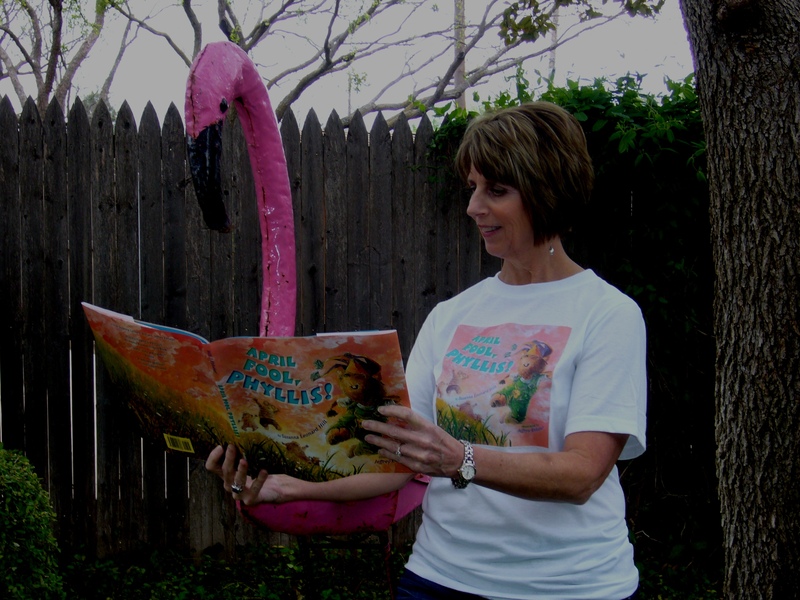 She wears her April Fool Phyllis t-shirt when she reads the World Tour posts. The t-shirt puts her in a special groundhog mood. She introduced me to Flo, the flamingo, who lives in her backyard. Penny read to Flo. 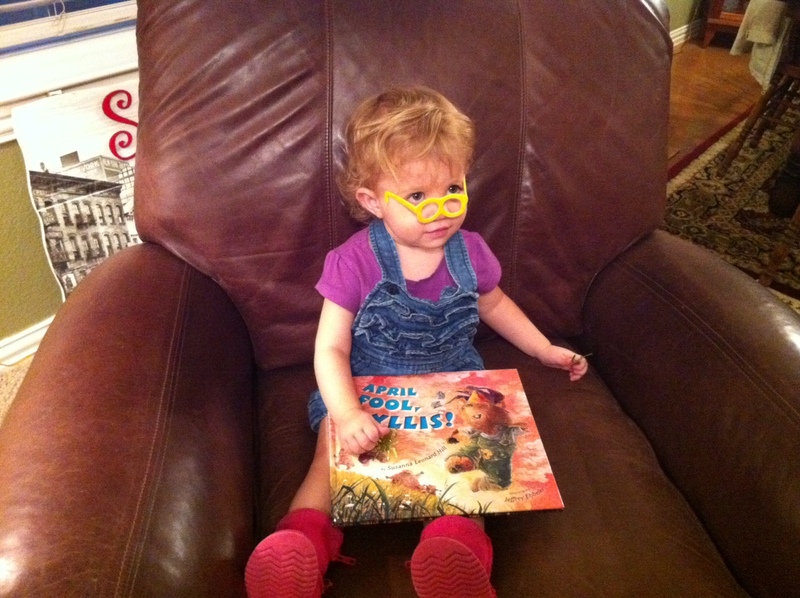 Flo loved the book so much that she insisted on reading it herself. 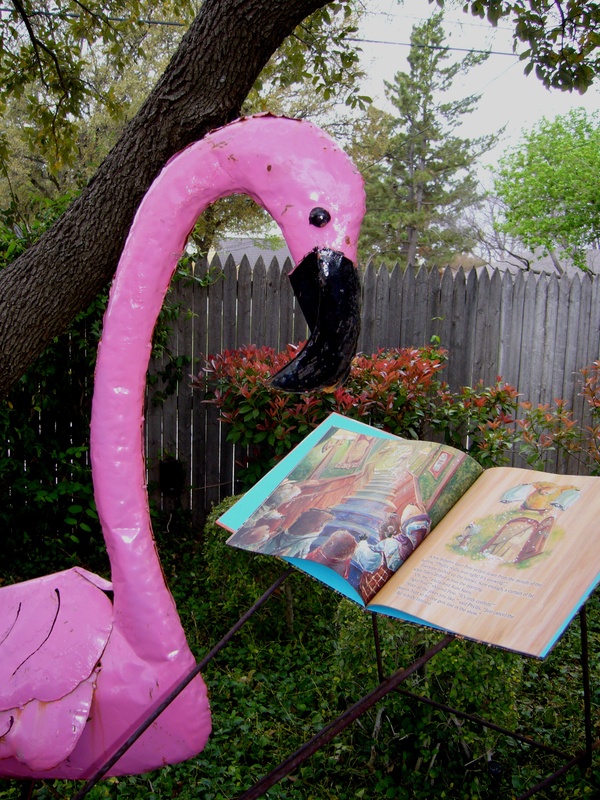 I didn’t realize that flamingos could read…but I didn’t realize groundhogs could go on world tours, either. I feel very special to have gotten a guest room with the perfect bed for burrowing. Look at that mound of pillows. Do you like my sunshine pajamas? They should be perfect for a good night’s sleep. 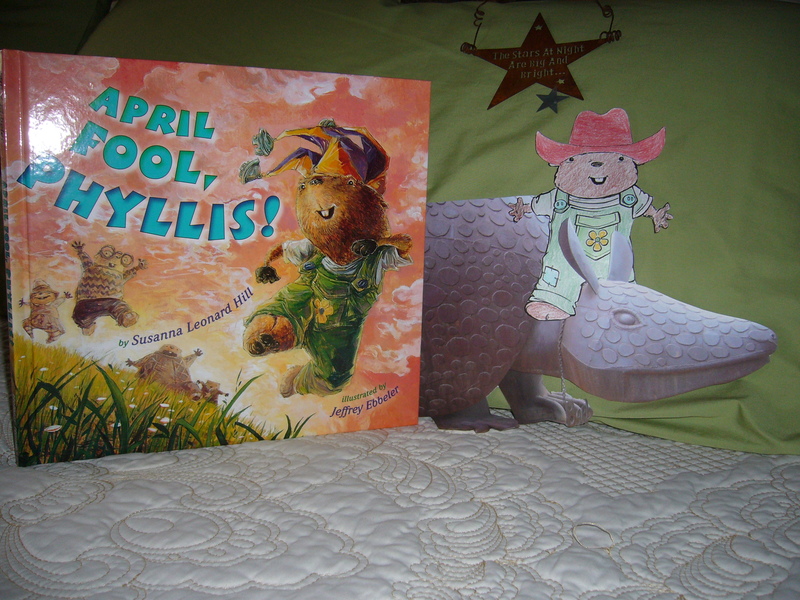 We are going to read April Fool Phyllis before I enter a short hibernation to rest up from my world travels. This morning I woke up refreshed. It is very windy outside and will be in the mid 70’s today. 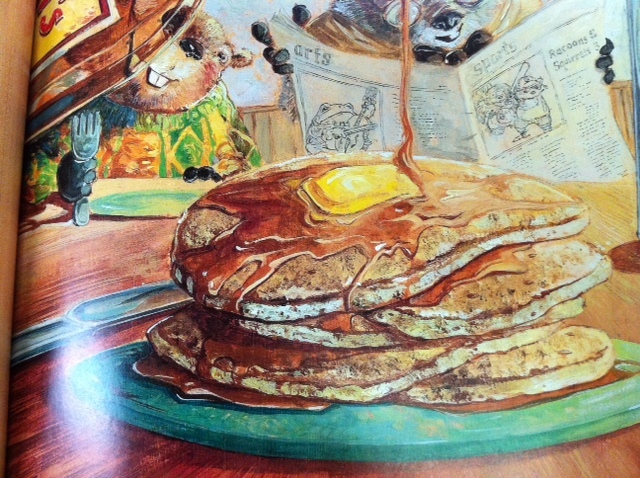 We started the day with my favorite breakfast…yummy, syrupy, buttery pancakes. Oh! I’m soooo full. I ate like a groundhog. 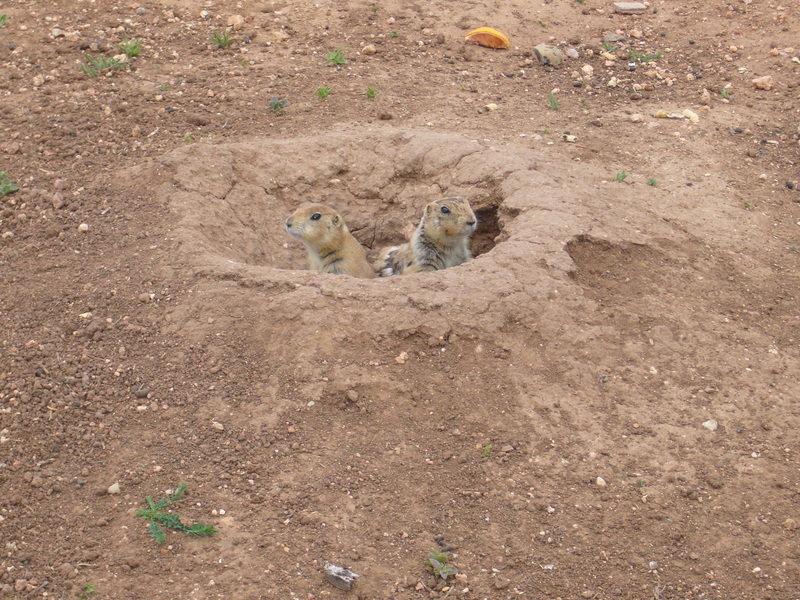 To start our day, we are off to visit some prairie dogs. 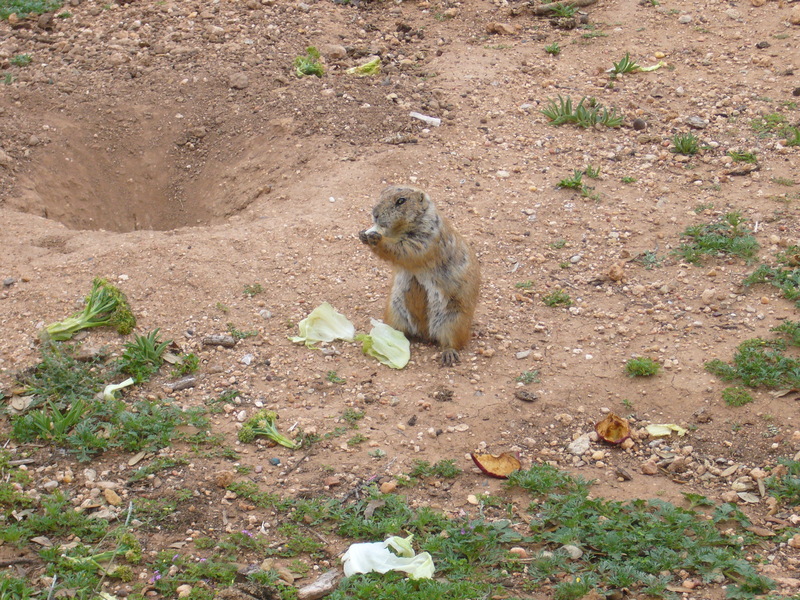 We are both rodents, but I am from the marmota monax species, whereas prairie dogs belong to the cynomys species. If you would like to read more about us here is a link for groundhogs, and here is a link for prairie dogs. Even though we aren’t the same species, they sort of felt like cousins because they live in burrows, too. I had no idea I had cousins in Abilene, Texas…but I do…lots of them. They were a friendly sort. I guess they have to be friendly, because they live in their own little prairie dog town within one of the city’s most popular public parks—Red Bud Park. This video shows just how friendly one little prairie dog was on our visit. 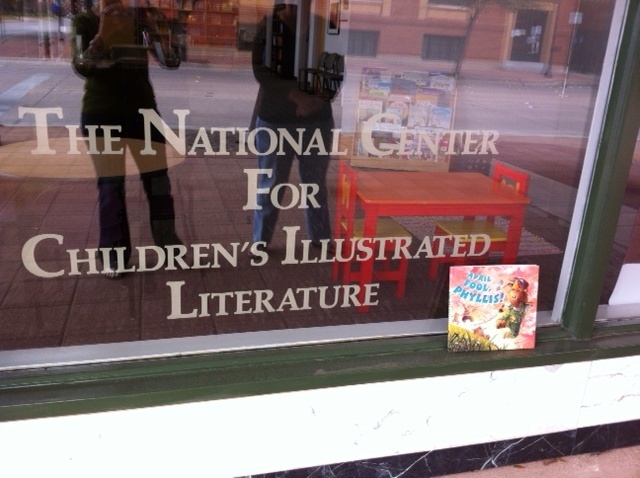 Next, I had a chance to visit the National Center for Children’s Illustrated Literature (NCCIL). Abilene is very lucky to have this special place. Here is a quote from their website. “The National Center for Children’s Illustrated Literature collaborates with award-winning artists to produce exhibitions of their artwork that are distinctive, appealing to museum visitors of all ages, and of the highest quality. In addition to this unique artistic partnership, following its debut at the NCCIL gallery each exhibition travels to museums, public libraries, and galleries nationwide.” Here is a list of the artists whose work has been displayed at the NCCIL. Here is a link to the NCCIL website. Currently, Dan Yaccarino’s work is on display. Click here to view his website. Penny doesn’t have any kids at home, but she took me on a quick road trip to visit her great nieces and nephews. They were thrilled to be a part of the my world tour. Before I left Abilene, I got to experience a little of the West Texas flavor! Here I am in my new red cowboy hat. And here I am riding an armadillo. The armadillo is the official small mammal of Texas. As you can see, Abilene was another fun-filled adventure for me as I tour the world. I am being dropped in the mail and it is 57° and rainy. 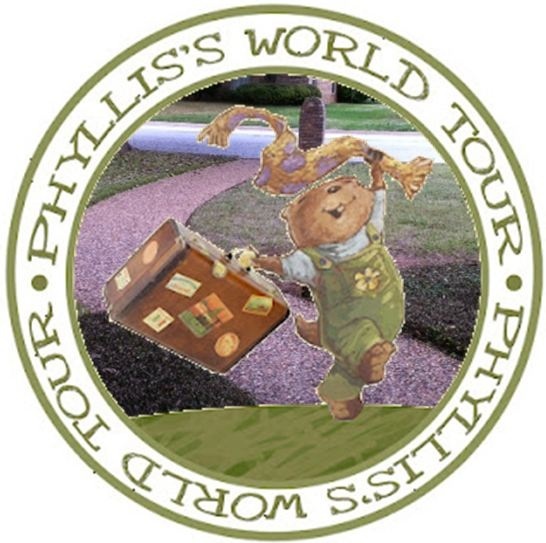 To see more details and to follow Phyllis on all her world tour stops, click HERE. We had fun making a short video to entertain you while I am traveling to my next stop-Parsonsfield, ME. Before we get to my choice for Perfect Picture Book Friday, I want to thank Diane for presenting me with not one, but two awards this week. 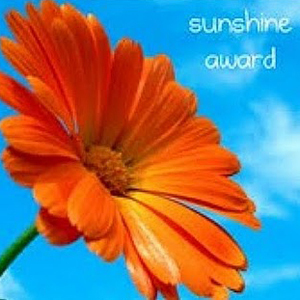 Thanks, Diane, for the Kreative Blogger Award and for the Sunshine Award. 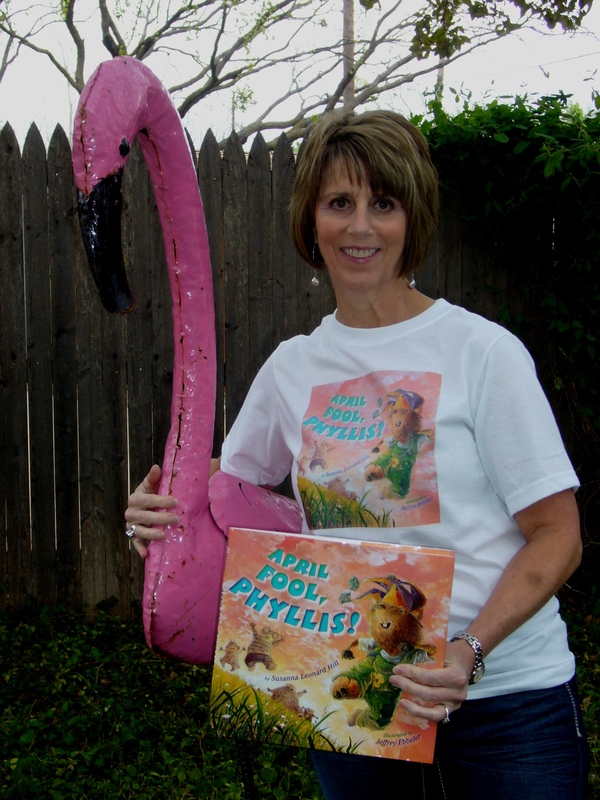 Visit Diane at her blog, here, to read great stuff about writing. 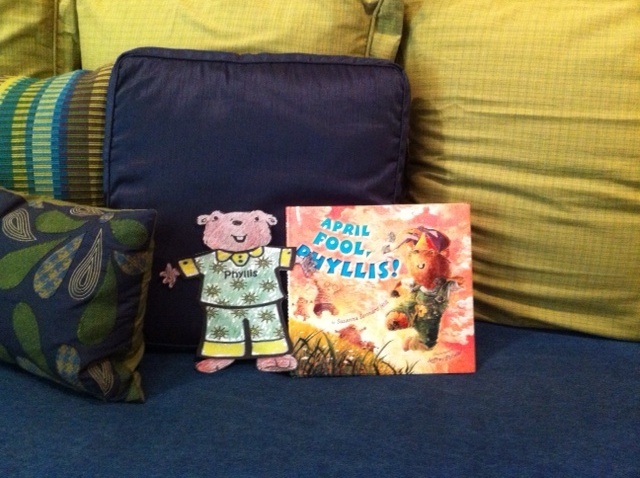 Now on to make favorite time of the week Perfect Picture Book Friday. 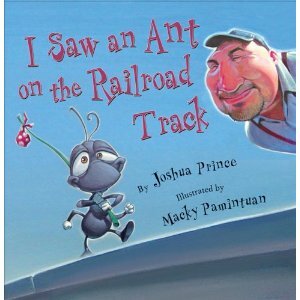 This week, I have chosen to review I Saw an Ant on the Railroad Track. Synopsis: (from Amazon) When Switchman Jack sees a black ant strolling down the railroad track in search of a snack, he tries to reroute a 10-ton freight train. However, the switch is stuck, and, just when readers start to worry that there will be an ant-astrophe, the tale takes a turn. “Well, I saw an ant on the railroad track. He was walking along, tickety-tack. doesn’t switch that ant to a different track. Resources: Listen Along Storybook I didn’t find other resources, but this book would add a fun element to a unit on insects, or to a unit on transportation. This books seems to use every single word that ends with “ack”, so it would be handy in a rhyming unit. Also…if little hobo ant doesn’t get his carcass off the railroad track, he will be smacked…pretty clear cause and effect. There are other instances of cause and effect in the story, also. Why I Like This Book: I love rhyme. A good rhyming book has a meter that is irresistible and that is exactly what this book has. The train-like cadence brings the tension alive as the reader wonders how in the world the Ant will stay in this world. The humor comes alive as Switchman Jack puts forth his best effort to save one little ant. This is a perfect read aloud. The illustrations are just beautiful. The illustrator, Macky Pamintuan, does a wonderful job with perspectives from a tiny ant to a brawny switchman to a huge freight train. 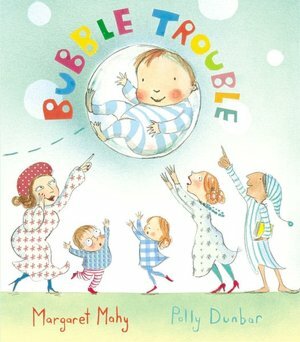 This week, I have chosen Bubble Trouble for Perfect Picture Book Friday. 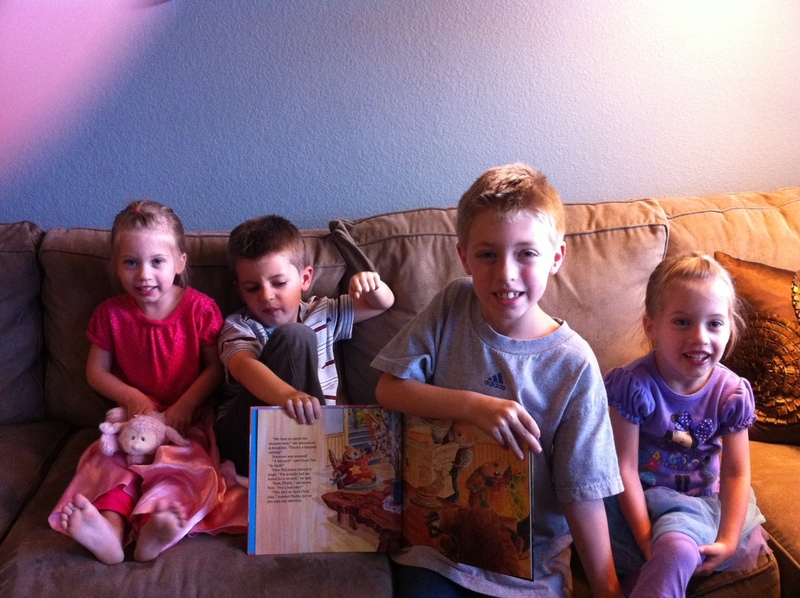 Synopsis: (from book jacket) When little Mabel’s bubble gets away from her, it’s her baby brother who gets into trouble. 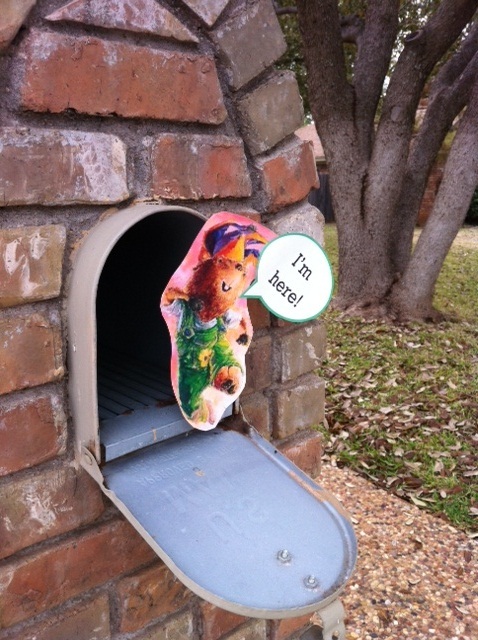 Soon he’s floating out of the house, above the fence, and all over town! And it’s up to Mabel, Mother, and the rest of the townspeople to get him safely back down. Who knew that so much trouble could come from one little bubble? Such a lot of trouble in a bibble-bobble way. where it bobbled over Baby, and it wafted him away. for he liked the wibble-wobble of the bubble in the air. and she shouted out for Mother, who was putting up her hair. as it bibbled by the letterbox and bobbed across the fence. Resources: I didn’t find resources, as such. I did find this list of Lesson Ideas. Why I Like This Book: As you can see from the opening lines, this is rhyming at its best. This book just sings. The rhythm and meter drew me into the silly, playful story from the first line. As the bubble floats through town, everyone tries to help save Baby. The names are so much fun to say: Chrysta Gribble and her lazy brother, Greville; Tybal and his jolly mother, Sybil; crumpled Mr. Copple and feeble Mrs. Threeble. All of this makes for a rollicking romp that will involve the entire neighborhood. The illustrations are beautiful and perfect. The art along with the text will have you bouncing along page after page. This book begs to be read aloud!